Getting feedback from your team members as quickly as possible is essential for a good team manager. That’s why some of you have requested the possibility of having the vote & feedback information on the dashboard. This information is more valuable for you than the activity log which was currently displayed. We think it’s a reasonable request and a good improvement and that’s why we have just changed the dashboard. The activity log has been moved to its own section and now you can access it using the link on the main menu. Replacing the activity log now you can see the last 20 votes and feedback. Votes and feedback are real-time. This means that you don’t need to reload the page to see new votes or feedback. They will appear automatically. Let’s see what new options we have now on the dashboard. You can see the most recent 20 votes on the dashboard. Press “View all” if you want to see them all and filter by employee or date. The name of the person who voted. The color of the name indicates the kind of vote she/he did. Green: Better than expected, Red: Worse than expected and Blue: As expected. The date of the vote/feedback and an icon that also indicates the kind of vote. If the team member left a comment along with the vote you can see it here. With this new dashboard you have all the important information right after you login. Checking the recent votes and comments and the Happy Mood Score and Involvement indicators allows you to detect if your team is performing well. Please, keep sending your feedback and suggestions to our email address: info@happymoodscore.com. We really love getting feedback. 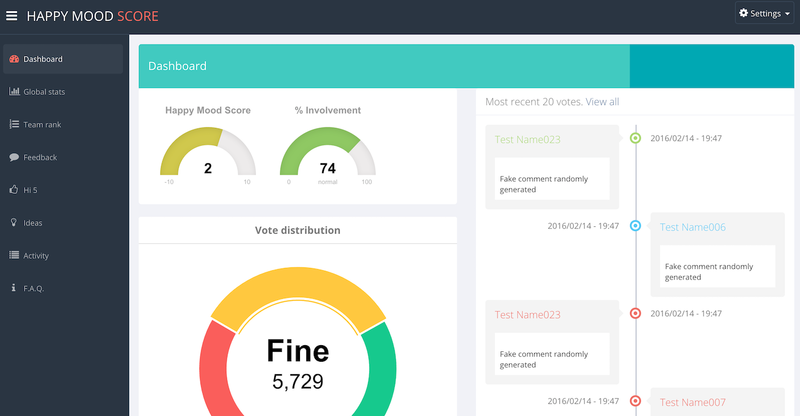 Happy Mood Score is a team management and employee engagement application for startups and agile companies. It is specially designed for team managers or human resources departments that need to manage remote employees or distributed teams. If you don’t have an account you can create one for free.